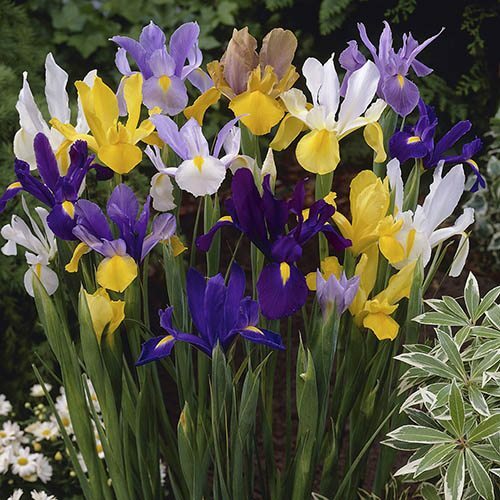 Dutch Irises make a wonderful addition to the spring garden with their highly unusual flowers. Plant them in pots or borders in a sunny spot and youll reap the rewards year after year! Ideal for indoor cut flower displays. Unusual and striking flowers in contrasting shades of purple, white, orange and yellow. Very hardy and easy to grow. Supplied as a pack of 100 bulbs in mixed colours, ready for planting out. Be sure to plant more than what you need so there are plenty to take cuttings of and use to create stunning indoor displays - or give a bunch to friends and family!